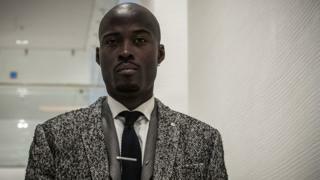 A French rapper who was on trial over an online music video entitled Hang White People has been found guilty of incitement to violence and given a suspended €5,000 (£4,280) fine. Nick Conrad, who is self-produced, was virtually unknown to the French public before he released the video last year calling for white babies to be killed. The video showing the rapper acting out the kidnap, torture and hanging of a white man sparked outrage. Conrad has said he will appeal. The rapper, who denies any racism towards white people, had argued the song was a comment on racism, and that the video was a fictional depiction of racism, designed to shock by inverting roles, and therefore not to be taken at face value. “The court had a reading of freedom of expression that does not satisfy us,” his lawyer said after the hearing. The court said in its judgement that if “the permissible limits of freedom of expression are assessed with greater flexibility” when it comes to rap, “the freedom of artistic creation is, however, not absolute”, the AFP news agency reports. The nine-minute video, first published on YouTube in September, was quickly suspended for violating the company’s terms of service. It depicts a white man being shot and tortured by the rapper and an accomplice. He is forced to bite the pavement and is kicked in the head before being hanged. Anti-racism groups had called the clip an incitement to violence and racial hatred. The charge against Conrad could have resulted in up to five years in prison and €45,000 in fines, but prosecutors requested a suspended fine of €5,000, saying he had “already to a certain extent paid the consequences” after he lost his job as a hotel receptionist. He was ordered to pay €1,000 in damages to each of the two anti-racism associations which brought the case.